If you are like me, you love all your friends and recognize how much each one adds to your life. Thinking about my own friends, I realize how many different kind of friends I am fortunate enough to have.. My friends are diverse, people from all walks of life. Some are from couple relationships, some are single, others are from past college days.Then there’s my beloved social media friends, very close friends, and the proverbial “best friend” commonly known as the “BFF”. I can’t think of one friend I would trade :). All are different, all special. As life happens, we grow, age, change and our interests lead us to different paths. Some of us are lucky enough to have a lifetime Best Friend who is usually there for us through most of our major life events. Events that build our permanent memories. Events like graduations, weddings, vacations, career changes and the whole gamut of wins and loses My best friend was with me in the delivery room, while I was in labor with my first son, who forgets that memory? Others prefer to have frequent “newbie best friends” and that’s okay. This mostly happens due to promitity of your best friend. It’s hard to stay close when you are remote from each other, but it’s very possible. I often get asked the question, “How have you and your “best friend” remained together all these years”? This question alone prompted me to write this post. No judgement, or over analyzing your words or actions, just be yourself. Secrets are in the vault. Trustworthiness matters. You trust them with your life. Dependable and reliable, all the time, not occasionally. Loyalty is next to “Lioness” protection at all cost. Respects and treasures the investment time of the friendship. #1 Fan, always cheering you on when others are absent. A shoulder to cry on and open ears to listen. No games, unless its cards. True transparency and honesty. Love for each other is unconditional, like family. I’m sure you have your own list of differentiators, but these are mine. We share profound experiences with our “Best friends” that shape and influence us forever. Here’s a poem I found that does a nice job defining our “Best Friends”. A good friend wants to talk to you about your problem. A best friend wants to help you solve it. A good friend hates it when you call late in the evening. A best friend asks you why it took you so long to call them. A good friend thinks the relationship is over after an argument. A best friend calls you after you had the argument. A good friend has never seen you cry. A best friend has had soggy shoulders from your tears. A good friend doesn’t know your parents name. A best friend has them in their contacts. A good friend will tell you what you want to hear. A best friend will always tell you the truth. A good friend expects you to be there for them. A best friend expects to always be there for you. A good friend is someone you enjoy hanging out with. 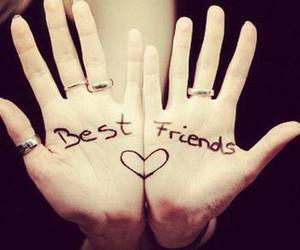 A best friend is someone you need. Now that the differentiators are clear… Go out there and find a BFF:).… If you have one already call them, and let them know how important they are to you. Don’t be shy. Expose your heart and make sure they know their place in your life. ← Why Natural Seaside Oats Are Important? Very true. Friends are so special, mine make me happy. My BFF is more like a sister since I never had a sister. Till today I have read many of your posts and appreciate most of them; but this is truly par excellence; it truly defines your personality. From your above post; I can easily make out why you have lots of friends; because, you know true meaning of real friendship. I don’t know much more about you; but from my end let me clarify you are my one of the best blogging or cyber friend; and you deserve it; because, like you I too believe and expect some qualities from best friend. Do you know the best part about our friendship; without interfering in to each other’s personal life or asking too many questions about our personal life; we are sharing many common similarities; and that is the best part of friendship; only one quality I would like to add in this list; your best friend always have well wishes for you; no matter wherever they are; the way I have all the time well wishes for you. Don’t you think you are over loading responsibility on my shoulder. It gives me immense pleasure, surprise & shock that versatile, creative, experience and very unique blogger of your stature, class and quality wants approval from the new bee like me. You seems in good mood of joking???????????? This is a good post. We can have many, many friends and over the years I have had a variety of different people who at the time were best friends. But time and miles have separated us. Through all of this my constant best friend happens to be my sister, who now lives with me. You have written well about friendship.